Duck Breath, firmly bolted to the hill overlooking Ensenada, gives his morning weather report and unique slant on world news most mornings on VHF 69. Our standard morning routine has one of us jumping out from under the warm covers (brrrrr) to dash into the galley to put on the tea pot to boil. Then back in bed where it is warm, then back out to add the tea once the whistle starts. Back in bed while the tea steeps. Then dash out again to grab fruit and tea and the handheld VHF. We sit upright in the master berth and switch on the radio for Duck Breath's morning soliloquy. Soon, the air outside is warmer than the air inside so we open up the the gangway and portlights and start our day on Traveler. It's such a nice way to wake up and it's how we want to wake up every day. 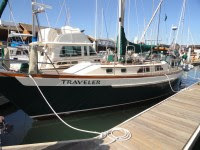 Traveler has moved from rocking and rolling around Baja Naval to the calm waters of Cruiseport Marina. The constant lunging of the boat was taking a huge toll on our dock lines and fenders so we had to make the move. We do miss being right there on the Ensenada Malecon, so close to the fish market and all the sounds and smells of a busy waterfront. 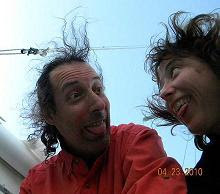 While at Baja Naval we had dinner with Marco and Naida on their sweet Passport 40 and the next day had an exciting sail and anchor practice out in the bay as a big storm was approaching from the north. 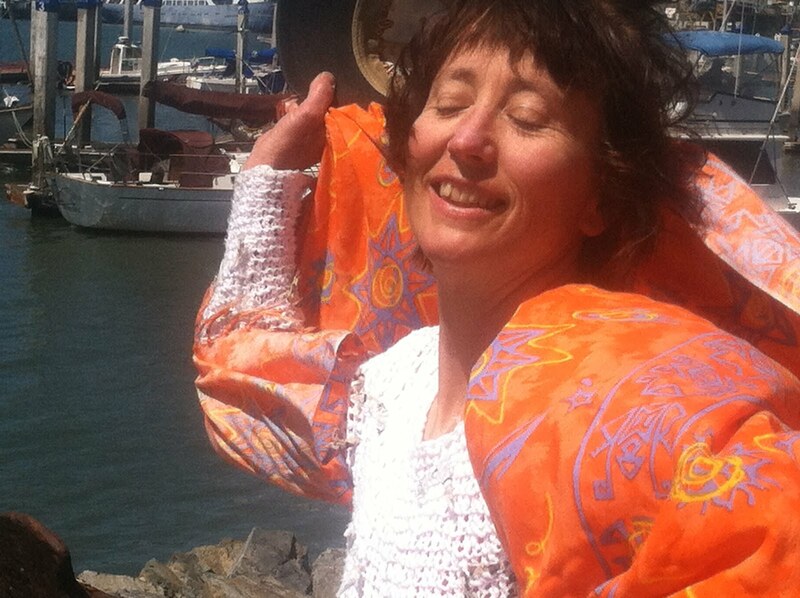 We only broke the main halyard turning block and the chain stripper on the anchor windlass on this outing. Not too shabby. We got turned on to a little family run restaurant/food stand called Carnitas Hnos Ramirez on Riveroll and Segunda. Each day they bring a roasted pig to their small restaurant. Mamma makes fresh corn tortillas on a griddle while Papa chops up the pork for a delicious pork taco for 14 pesos. Every day, only one menu item, except on Friday when they fry up all the pork fat and load a table up with fried pork rind, free for the taking. If you don't tell them otherwise they will see you are a gringo and pull out very lean cuts for your taco. But I'm sure it's more flavorful to have the standard mix that has a higher fat content. It's right next to the SuperAqua water store where we fill our 5 gallon "garrafon" for 7 pesos (about 50 cents). At Cruiseport we met many of the live-aboard gringos at a Sunday potluck. Quite a few old salts living single and fixing their boats up (forever), and some couples getting ready to head south in November. Not exactly an exciting bunch but I'm sure we'll find some adventurous types or at least musicians as time goes by. The to-do list gets longer and shorter, longer and shorter, and Connie and Scott are trying our best to be patient as it all starts to come together. Like making a roux, huh? It takes time to do it right. In the meantime, give me one of those pork tacos and let's go find a cerveza to go with it.